Based in Wilmington, North Carolina, Magus and the Plastic Infinity is an exploration of the possibilities of sound. From the most basic blues, jazz, and rock influences to the most far reaching free-form psychedelic wanderings, the music bounces off of the influences of groups like Pink Floyd and The Jimi Hendrix Experience, and weaves them into their own strange blend of sound-scapes. There is definitely a fusion happening, between the movements and chord structures that make jazz so cool and complicated and the pop sensibilities that draw you to bands like The Beatles. The weirdness that keeps you going back to your Doors and Frank Zappa records is there, too. This is truly a music for the connoisseur. Your feet will feel the driving power of heavy hitters like Robin Trower. Your head will experience the sophisticated introspection of bands like Jane's Addiction and Jethro Tull. Some of it is indeed very heavy, but not at the expense of insulting your intelligence with teenage lyrics and chunk-a chunk-a metal riffs, until you want to puke. In the tradition of bands like Steely Dan, the lineup of the band changes from time to time. 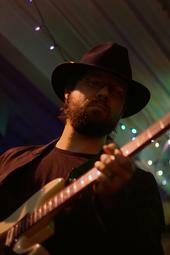 The main force behind the music is the songwriting of Guitarist/Vocalist Magus (pronounced may-jus). 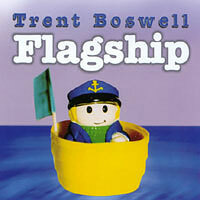 In 2003 Magus put out a solo album under the name Trent Boswell. The album is called Flagship. It is nine original songs in a style that Magus light-heartedly calls "Purple Mind Licorice Music". It's melodic, engaging and unique. Call it "art rock" if you like. Think of it as head candy. The Plastic Infinity plays all the material that is on Flagship as well as a lot of edgier, more aggressive, electric material and a host of upbeat, funky, back-beat oriented grooves that people can move to. The music is sometimes spaced-out, trippy and hypnotic, sometimes rock and roll and sometimes funk. The music all has a common thread, but variety is their hallmark. The group swings tempos and vacillates from folk, to blues-rock, to jazz, to heavy grooves, and back again. They are musically daring and committed to interesting motifs. This is a band that is not caught in the three chord pop tune hell that is prevalent on the average radio station (not to mention in the seventh plane of hell). A portion of their repertoire is acoustic in nature and will further demonstrate their versatility. The lyrics are not plucked from the lyric tree, or wrapped in cellophane, either. Written by a poet and carefully formed, they demonstrate the integrity of the music, and tell the tales of men who lead the examined life. Often cerebral but always relatable, they crown the journey into the inner ear that is the phenomenon known as The Plastic Infinity.... You'll just have to hear for yourself. The demo tracks you hear on the music page are from the Flagship album and are a good introduction to the sound of the band. The other tracks on the music page were recorded at Cape Fear Community College for the television show AMPED which gave Magus & The Plastic Infinity some really great exposure, airing quite a number of times in Wilmington, NC. There are also some recordings of Magus playing jazz instrumentals. Flagship is an album that gets better with each listening. Put the headphones on. Turn out the lights. Go on, take the Plastic Challenge. Or, try using astral travel or E.S.P. Please help us out by calling the local radio stations to request tracks from Flagship! Get some Purple Mind Licorice MUSIC Here!